I’m not sure when I started using magnification in dentistry, but I estimate it’s been about 17 years. I started with some 2.5x telescopes from Orascoptic. They are technically and properly termed telescopes, even though they’re commonly called “loupes.” Loupes are technically a device that uses lenses that are single-element… a single piece of glass that magnifies. Telescopes are multiple-element lenses. Just going to 2.5x magnification from the “naked eye” was a tremendous revelation. But, then I wanted more. Next I got a fiber-optic headlight (Zeon from Orascoptic) that clipped on to my Orascoptic frame. Adding co-axial illumination to a magnified field of view is another quantum leap in visibility for a dentist. And, because it’s coaxial, you have perfectly even and bright light whether you’re using direct vision or reflected vision with your dental mirror. Wherever you look, there is light! LOTS OF LIGHT! The lights consisted of a light source (big box with a noisy fan) and a rather delicate fiber-optic cable going to the frames punctuated by a reflector and lens clipped to right over the nose-piece. And, a number of times I got up from my chair without unhooking the cable from the box. It was always a bit embarrassing when my head whipped back and the box came flying off the counter! Of course, the box housed an expensive bulb that would burn out and be replaced periodically. And, eventually, the box would burn itself up or crap out in some way. At about $500 each, I went through a number of light source boxes. I also had to replace a fiber-optic cable or two and about $500 each (if memory serves). I just went to my light box “grave yard.” I have two Orascoptic (Zeon) and two DFV (Dentalite) boxes. As I evolved as a dentist, I wanted even better vision. I got a pair of 3.5x from Designs for Vision along with a back-up pair of 2.5x. 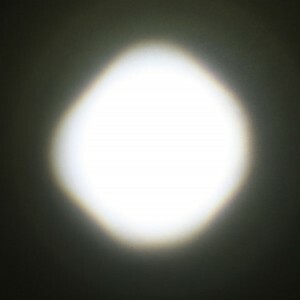 DayLite shining on a white piece of paper. A very homogenous light spot. Incidentally, when you go to 3.5x and higher, there is a noticeable drop in the amount of light coming through. It’s just the nature of optics. The traditional dental chair light is not enough. Furthermore it casts shadows, as it’s not parallel to your line-of-sight. You MUST have a headlight if you go 3.5x or higher. Since getting my 3.5x telescopes, I no longer use my 2.5x for exams or treatment. I sometimes use the 2.5x in the lab, though… or trying to read the small print in the instructions that typically come with dental materials! Years ago it was “all ball bearings.” Today it’s all LED. A few years ago (when my fourth light box kicked the bucket), I got around to buying DFV’s DayLite LED headlight. 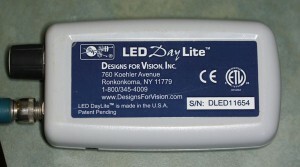 The LED light source is actually in the headpiece and weighs only 0.5-ounces. 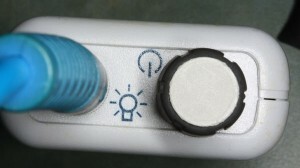 It’s connected by a cable to a battery pack that easily slips in your clinic jacket pocket (or can be clipped to your belt). The DayLite comes with 2 battery packs. They each last about 4 continuous hours. In my practice, I find they last a full day. It’s not constantly turned on. While one is being used, the other can be charged. No bulbs to replace! The brightness is adjustable by a knob on the battery pack. And, the quality of light is superb. The spot of light is very homogenous – no dark spots or hot spots. Recently, I dropped my 3.5x on the floor. After catching my breath… Nothing was visibly broken when I picked them up. But, when I put them on, I saw two of everything. Not good! Apparently the frame got bent. When I squeezed the temples together, the telescopes converged and focused properly. But, I need my hands to operate. So, I contacted DFV by email and got a prompt response on where to send them. I sent them to DFV and had them back (with brand new frame) in about a week. Awesome customer service. During that week, I used my 2.5x telescopes and didn’t like it! But, it was better than nothing. The DayLite mounted on the DFV frames. The orange filter can be swung over the light to prevent curing composite materials. Over the years, I’ve “debated” dentists about the value of magnification and co-axial lighting. Many don’t want to spend the money. Some argue, “My vision is fine.” So is mine. And, some will even argue, “Yeah, but then you get used to it and can’t work without it.” Ummmm… YEAH! And, that’s a problem, HOW? It’s true, that once you see things so much better, you don’t want to go back. Now, I’ll launch a preemptive strike at the microscope fan-bois, who will (rightfully) argue that a microscope is EVEN BETTER. Surely, it is! But, here on The Dental Warrior, I’ve said I strongly advocate for products that significantly improve our work, comfort, and results at a price that doesn’t require a loan, conferencing with your significant other, or going hungry. Surgical telescopes fall into that spectrum of “no-brainer.” Microscopes are quite a bit more pricey and may require some financial planning or forethought. And, microscopes have a bigger learning curve, not to mention simply changing your operatory to accommodate them. To be clear, I’m NOT arguing against microscopes. It’s just that telescopes are a bit more “doable” for most dentists. At the very least, telescopes offer a perfect “stepping stone” to microscopes. To wrap this up… If you have never used magnification and a headlight before, I can’t recommend it highly enough. It’s quite literally a “night and day” experience. Everything you do is EASIER, faster, and less stressful. The first time you chase a broken root tip with your telescopes and headlight, you’ll be VERY thankful you have them. Finding canals is easier when the floor of the pulp chamber is lit up. You’ll even see decay that you may have been missing before. 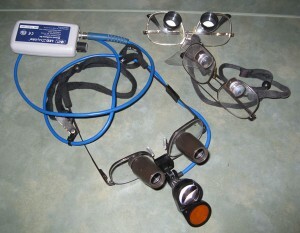 This entry was posted in Dental Product Reviews, Tips & Tricks and tagged dental headlight, Designs for Vision, loupes, magnification, surgical telescopes. Bookmark the permalink. 26 Responses to Seeing Teeth Better and Seeing the Light! Mike – awesome blog post, and spot on target. And I’ll even concede the point about scopes being a lot more expensive, so in some ways they don’t fit the “warrior dentist” ethos, but they can…….as long as it’s a smart financial decision. I’ll make another argument for the scope being worth considering – your back! It’s hard for any dentist – using loupes, no loupes, whatever – to keep up a demanding schedule without putting some strain on the lower back, and a scope can make it possible for a dentist with back pain to practice far more easily. That said……it boggles my mind how many of our colleagues don’t use any magnification at all. With every step up in mag, you find yourself saying, “Damn, I couldn’t see that before!” 2.5x is still way better than nothing, and 3.5x with a headlight is gonna make anyone’s life a lot easier and dentistry better, and above that…..you’re going to wonder how you ever practiced without them. I would add a recommendation for you – if you go to the DFV 4.5x loupes, be sure and get the expanded field (EF) versions, or your field of view will be noticeably constricted. Before my scopes, I couldn’t work without those DFV loupes. Superb quality, excellent customer service. Not the cheapest, but well worth the difference IMO. Hi Chip! I knew you’d chime in. As for the back issue, if your telescopes are set up properly, it forces you into a good posture. I can tell you from personal experience that my telescopes saved my back and neck – BIG TIME. I had Orascoptic 2.5’s for over 10 years until about 2 years ago, when I went up to their 4.3’s. All I can say is wow and I wish I went higher! Magnification and lighting go a long way to improving what we see and the quality of care that we deliver to our patients. I am an 05 graduate and my class was REQUIRED to buy Loupes. I can’t practice without them and I am a young dentist. I had orascoptic forever but realized if they broke I was screwed. I got some DFV with slight higher magnification. As a “Mike Minion” I guess I need to get a led headlight!!! Yep. That looks like mine, except I’ve got the orange composite filter added on. You will LOVE IT. Make sure you get two batteries so you’ve always got one charged up and ready to go. I don’t know how I did quality dentistry without the loupes and headlamp. It makes me laugh at how excited I was about fiber optic handpieces. I think I’ll look into some higher mag loupes in the very near future. I started using those inexpensive plastic flip down Opti-visors. Better than nothing. Next I tried the DFV 2.5’s and loved them… for a while. Five or so years later I tried the 4.5’s but the depth of field was pathetically shallow. I wasn’t willing to travel that learning curve. The 3.5’s with their mini- led lamp has been great. Huge difference over magnification without the lamp. I recommend the clunky Buddy Holly frames. They are pretty comfortable and much more resistant to bending. I believe once you get to 3.5x or higher, you really need the headlight. And, the headlight makes it SO much better. I am about to buy my first set of loupes! It’s amazing how much difference the LED head light makes. We didn’t use them in our simulations lab and while shopping around and trying them on, I was just amazed. Technology. I truly could not work without my magnification and headlight these days. I’ve had 2.5x Orascoptics for about 10 years, though only have been using them for the last 3 or so. Initially I found them difficult to work with (did not even give it a day back then). After hitting my late 40’s, it was no longer an option – if I was going to continue to practice “good” dentistry, I sort of needed to… umm… SEE !! My prescription recently was updated, and it’s time to trade in the old 2.5 (Dimension 3). I have pretty much decided on going with a 3.3-3.5 magnification – but just haven’t decided on which brand to go with. Obviously a light is in the cards as well, though I think I’d prefer one with is mounted on the frames rather than a separate headband. Considering the HiRes 3 (3.3x) by Orascoptic, but everything they have seems to be at a premium ( $ )! Is there a difference in the quality of the optics between DFV products and Orascoptic? What about other manufacturers? Of course they all say that their product is superior, and I am sure many have their good points. It’s just hard to sort out! I have someone from Orascoptic coming by my office next week to have a look – probably going to contact DFV as well. I’d like to also get loupes for both of my hygienists, neither of which have ever used them. One wears glasses (prescription) the other does not. I would place the bar for theirs lower than my bar (2.5x) and no illumination. What brand do your hygienists use? Interested in and suggestions or comments! I lean towards DFV. But, Orascoptics are good, too. I would recommend trying both and picking whichever you like best. As for hygienists… I bought the adjustable Orascoptics (I think the’yre called “Pearls”) for mine. Thanks for the quick reply! I just reloaded the page to see if there had been any (never received an email notification). I’ve done some more reading and I’m leaning towards going with LumaDent’s light. When I clean my Orascoptics I use water and liquid soap (same as I do with my own glasses), then pat dry with a cotton towel. The return is many years of scratch free lenses. Do you know what the recommended cleaning method is for the DFV’s? Can they be fully rinsed (submersed if you will) in water? Actually, I don’t know what’s recommended. But, I’ve always used alcohol-soaked 2X2s. No scratches, yet. Any advise on the best light for Zeiss Eyemag Smart loupes? 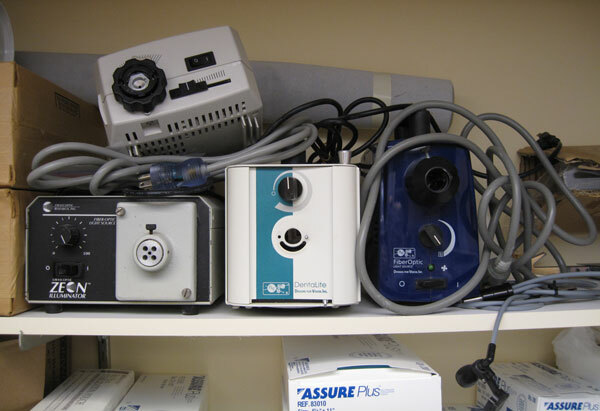 Once I saw your loupes and light graveyard, I saw a flicker of hope. 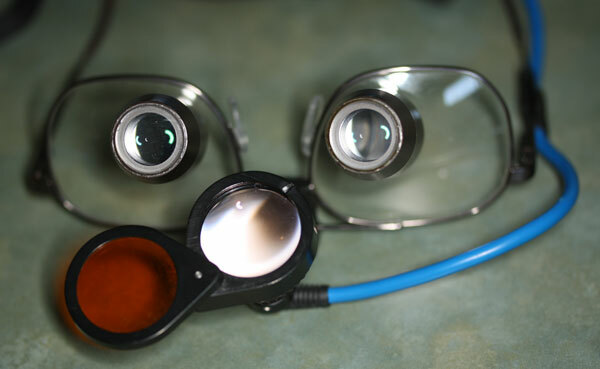 I am on my 2nd generation of loupes – zeiss – I love the optics, don’t care for the cheap plastic mounting and especially for the crappy led light that they sold me. 1500 for the light down the tubes and 4 years later of constant problems, it is dead. I am all for investing in equipment but do not want to be screwed again. Any thoughts on super reliable I-don’t-have-to-think-about-it-anymore brand? I think the best two brands are Designs for Vision and Orascoptic. I believe Designs for Vision has adapters for just about every kind of frame out there. Give them a call first. I upgraded from a 3.5 to 4.5 magnification with extended design for vision loupes. The increased detail and amount of stress fractures seen on teeth is dramatic from the 3.5. Great for diagnosis of teeth needing full coverage restorative and other defective restorations in need of replacement. In your opinion what are the best light sources to use with my loupes. I am currently using an LED light from design from vision which is adequate, would like a bit more light intensity. I was wondering how their double LED worked and if it was worth the additional expenditure. Thanks for the comments about the 4.5s. One of these days, I’ll get around to going “bigger.” I know that as you go up in magnification, the amount of light transmitted through the lenses decreases. So, the higher the mag, the more light you need. I have no experience with the double-LED light, so I can’t offer any comments on it.